Java coding interview questions are mostly some programming exercises which is asked to be solved in java programming language in limited time during any core Java or J2EE interview. No matter whether you have 2 years of experience or 4 years of experience, There is always some coding interview question in Java programming job you are applying. Actually questions related to Java Coding are increasingly getting popular on Java interviews for two reasons, first its difficult to crack Java coding interview questions than answering fact based questions like Why String is immutable in Java or Why main is static in Java; Second reason of popularity of Coding question in Java interviews is read need of good developers who are required to do lot of coding in projects rather than doing some maintenance works. Since Java is front line language for any server side application, and as complexity of business process and need of performance is increasing, its obvious that amount of coding skill required in Java programmers are getting increased with every passing days, which effectively mean Java coding questions are top of any list of core Java interview question. These Coding interview questions are collected from various Java programming interviews, from friends and colleagues and can be a good starting point to refresh your coding skills before appearing on any Java interviews. These basics Java Programs and logical questions can also be a good resources for learning programming and to improve your problem solving skills in Java. Here are my list of 10 Java coding interview questions and answers, which is good to prepare before appearing on any Java interviews. As I said Java coding questions are mostly based on programming, logical analysis and problem solving skill and are on top of any list of tough Java interview questions, so better to get it right in first place. Any way you may be able to solve and find answers of these Java coding questions by yourself, but if you stuck do a google, and you can get many alternative ways to solve these problem. Some times knowing more than one way to solve any programming question or coding problem in Java also helps to impress interviewer. This list mainly contains basic programs asked on Interviews. This is a tricky Java coding interview question is asked in one of the written test my friend had appeared recently. This Java coding question can be solved in multiple way e.g. by using charAt() or subString() method, but any approach throws couple of follow-up question e.g. you may be asked to write two version to solve this coding exercise, one by using recursion and other by using Iteration. They may also ask you to write JUnit test for this function which means handling null, empty string etc. By the way this programming question is quite common on technical interviews not just Java but also C, C++ or Scala, but knowing API definitely helps to produce better solution quickly. Write a Java program to print Fibonacci series upto 100? FizzBuzz problem : Write a Java program that prints the numbers from 1 to 50. But for multiples of three print "Fizz" instead of the number and for the multiples of five print "Buzz". For numbers which are multiples of both three and five print "FizzBuzz"
This is also one of the classical programming questions, which is asked on any Java programming or technical interviews. This questions is very basic but can be very trick for programmers, who can't code, that's why it is used to differentiate programmers who can do coding and who can't. Write a Comparator in Java to compare two employees based upon there name, departments and age? This is pure Java based Coding exercise. In order to solve this Java coding or programming interview question you need to know What is a Comparator in Java and how to use compare method in Java for sorting Object. Sorting is one of the most logical and practical question on technical interview and ability to sort Java object is must to code in Java. This article help you to solve this Java coding question by explaining how to sort object in Java using Comparable and Comparator. Just remember that Comparable has compareTo() method and use to sort object based upon there natural order e.g. numeric order for number, and alphabetic order for String, while Comparator can define any arbitrary sorting. A good followup question can also be difference between Comparator and Comparable in Java, so be ready for that. This kind of Java coding interview question appear in written test and I believe if you get it right, you are almost through the Interview. These kind of problem solving questions in Java are not easy, you need to design , developer and write JUnit test within 2 to 3 hours and only good Java developers, with practical coding experience can solve this kind of Java programming question. What helps you is to keep practicing your coding skill even before interview. See this programming exercise in Java to get yourself going. I personally like to ask programming questions, which test your object oriented design skills e.g. 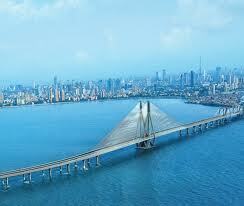 designing ATM machine, designing parking lot or implementing logic for Traffic Signal controller. Write a Java program to check if a number is Armstrong or not ? Another popular logical coding interview questions in Java, which is based on programming logic. In order to answer this programming question, you need to know what is Armstrong number, but that is not a problem because question may specify that and even provide sample input and output. The key thing to demonstrate is logic to check if a number is Armstrong or not. In most cases, you can not use utility methods defined by logic and you need to produce logic by yourself by using basic operators and methods. Write a Java program to prevent deadlock in Java ? Some of the programming or coding interview question is always based on fundamental feature of Java programming language e.g. multi-threading, synchronization etc. Since writing deadlock proof code is important for a Java developer, programming questions which requires knowledge of concurrency constructs becomes popular coding question asked in Java Interviews. The deadlock happens if four condition is true e.g. mutual exclusion, no waiting, circular wait and no preemption. If you can break any of this condition than you can create Java programs,which are deadlock proof. Write Java program to reverse String in Java without using API functions ? One more basic Java program, which made it's way to Interviews. One of the simplest coding question and also a very popular Java programming exercise. Beauty of these kinds of logical questions is that, they can really test basic programming skills or a coder, programmer or developer. Not just problem solving, you can also check there coding style and thought process. By the way. 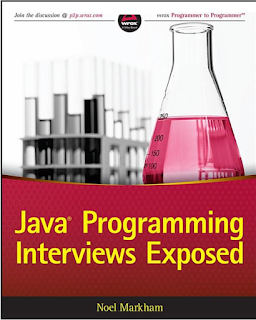 you can check the Java Programming Interview Exposed for many of such Java coding interview question. It also covers other important topics e.g. Spring, Hibernate, Java Fundamentals, Object oriented programming etc. This Java program might require just four lines to code, but it's worth preparing. Most of the programmers make same kind of mistakes, while writing solution for this program e.g. Integer overflow, they tend to forget that integer can overflow if it's limit exceeded, which is not very big. Sure shot way to answer this programming questions is to use XOR trick to swap numbers, as mentioned in that blog post. Create a Java program to find middle node of linked list in Java in one pass? Any list of programming questions is incomplete without any questions from linked list, arrays and string, these three forms bulk of coding questions asked on Java interviews. Trick to solve this problem is to remember that last node of linked list points to null and you can trade memory with speed. Sometimes your approach to come to two pointer solution really matters, by taking rational steps as mentioned above, you can sound more intelligent, problem solver and genuine. Quick solution of this programming question can be found here. Another programming question based on linked list. By the way this coding question is bit tricky than previous one, but this can also be solved using two pointer approach. If linked list has cycle, than fast pointer will either catch slow pointer or point to null. 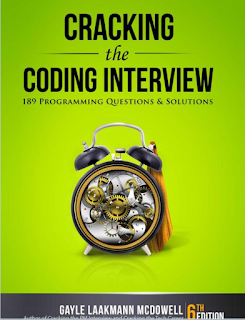 If you want to practice more such questions based upon linked list, array, and String and asked in various companies before, then I suggest you to check the Cracking the Coding Interview, it contains more than 190 questions from various tech companies, startups, and service based companies like Infosys, TCS, and Wipro in India. Implement Producer Consumer design Pattern in Java using wait, notify and notifyAll method in Java? Similar to deadlock related programming interview question, this is also used to test programmers ability to write bug free concurrent programs in Java. This coding questions can be difficult if you haven't used wait and notify before, you can confuse yourself as hell on different aspect e.g. which condition to check, on which lock you should synchronized etc. I suggest following here to answer this multithreading based programming interview question. Write a Java program to calculate Factorial of a number in Java? These are some of the Java coding interview questions and answers, which appears frequently on Java Programming interviews. I have included links, with some of my blog posts, which discusses answers of these Java coding question, but you can also find answers by doing google yourself. Please share what kind of Programming, logical, Problem solving or coding related questions, asked to you in Java interviews? Thanks for reading this article so far. If you like these Java Programming Coding Interview Questions then please share with your friends and colleagues. If you have any question or suggestion then please drop a note. Write a Java program to create deadlock ? how do you fix it ? I agree that these Java programming question are basic but in my opinion you need to be better than average programmer to be able to write code which does that correctly. It's probably not the desired answer, but it is a one-line solution that answers the question as asked and demonstrates knowledge of data structures. how to star print in rotate style..
very nice collection of information and improve them. Re question "Write a Java program to replace certain characters from String" seems like the example method is missing a replaceWith parameter no? Write a Java program if 1st digit is 1 then it is replace by 0 and vise vera, and for 2nd digit if 1st and 2nd digit are 1 make it 0 and vise versa in an input array. 1) How to remove duplicates from an array of Integers, without using API methods in Java? 2) Code to implement binary search in Java? let me know, if anyone has answers for these questions? Some of these questions have appeared in a written test on Java programming, I had given few months back. I would personally like to see more questions from class loading involving static and non static variables, questions which are confusing enough on overloading and overriding, questions which has some tricky concept on it etc. Though these are still good for beginners, you would like to add few more for experienced Java programmers. suppose number 8 is missing from the array 1..10.
how can u give that sum of 10 numbers where we dont know which number is missing among the 100 numbers? Just Subtract the current number from previous number. If the difference is 2, (Previous number + 1) is the missing number. This program should work for any four digit whole number. Well I answered it so I might as well post it here..
(Might be some better String/StringBuilder API functions than the ones I used)..
3. Write a program that reads from the user four integers representing the numerators and denominators of two fractions, calculates the results of the two fractions and displays the values of the fractions sum, subtraction, multiplication and division. 2. Write a program that reads in from the user an integer (num) between 1000 and 9999. Then it prompts the user to enter an integer (d) between 0 and 9 and a character (ch). Your program should replace the second and the last digit in num with d and it should display the character that precedes (ch) followed by the number after the change and then the character that comes after (ch). Use the division and modulus operators to extract the digits from num. Number was 2134. Result: a2636c. 1. Write a program that takes three double values x0, v0, and t from the user and prints the value x0 +v0t +g t2/2, where g is the constant 9.78033. This value is the displacement in meters after t seconds when an object is thrown straight up from initial position x0 at velocity v0 meters per second. I think these questions are good to start with problem solving and algorithm building only, I wouldn't say they are challenging for a Java developer with just 1 year of experience. There is no algorithmic question from binary tree, B tree, balancing tree, traversal, linked list, stack, queue, graph, just bunch of practice questions. Below is my code for this problem. About developing JUnit Tests...do they allow use of Eclipse or must be done from command line???? Excellent and frequently ask list of java code interview questions with answers/ solutions. I am looking for the list of java questions and answers. While searching on google, I found this blog post. Thanks , It will surely help me. I partially read some of your blog and bookmark it for future use. 1. Write a program to calculate the angle between the hour hand and the minute hand of a clock if the time is given in a string format. For example if the time is given as 12:15 the output should be 90degrees. 2. Write a program to evaluate a mathematical expression given in string format without using inbuilt eval() function. For example input would be a string variable of the form 5*10/20+6 and your program should output the result. The challenge here is first you have the input in string format and secondly you got to follow the BODMAS rules. Thank you Anjana for sharing these useful interview questions with us. Do you mind sharing your answers as well? Hi, Can you share the answer of your 1st question? Why do you think that i % (3*5) == 0 is right algorithm in FizzBus problem? I am sure, that you should march 3 and 5 simultaneously, then 3 and 5 separately. But 15 is wrong idea. What can you say? What is the basic reason for this question? i am a java beginner,i don,t know which database are best with java,java(spring),mysql,sql server,or oracle which one i need to learn. you can pick mysql or oracle. theres not much difference between them. Where can I find Java development tasks for a job interview? I bought "TOP 30 Java Interview Coding Tasks" by Matthew Urban as well. Really recommend. Good book, all the infos there. Thanks.